Revolutions are melancholy moments in history—brief gasps of hope that emerges from misery and disillusionment. This is true for great revolutions, like 1789 in France or 1917 in Russia, but applies to lesser political upheavals as well. Conflict builds into a state of tense confrontation, like a powder keg. When a spark is thrown, an explosion takes place and the old edifice begins to crumble. People are caught up in an initial mood of elation, but it does not last. Normality catches up. Why do revolutions occur? In this completely revised edition of The Modern Social Conflict, Ralf Dahrendorf explores the basis and substance of social and class conflict. Ultimately, he finds that conflicts are about enhancing life chances; that is, they concern the options people have within a framework of social linkages, the ties that bind a society, which Dahrendorf calls ligatures. The book offers a concise and accessible account of conflict's contribution to democracies, and how democracies must change if they are to retain their political and social freedom. This new edition takes conflict theory past the fall of the Berlin Wall in 1989 and into the present day. 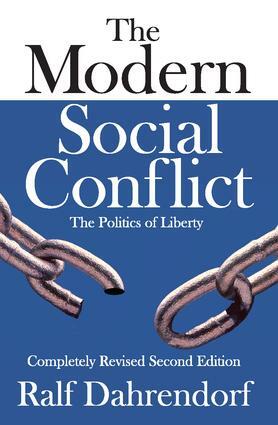 Upon publication of the original 1988 edition, Stanley Hoffmann stated, "Ralf Dahrendorf is one of the most original and experienced social and political writers of our time. . . . [this book] is both a survey of social and political conflict in Western societies from the eighteenth century to the present and a tract for a new'radical liberalism.'" And Saul Friedlander wrote, "Ralf Dahrendorf has written a compelling book . . . the brilliant contribution of a convinced liberal to the study of conflict within contemporary democratic society."